Storage Tanks, Ship-building, vehicles, pipes, galvanized plants, bridges, heavy equipment, building structure, etc. P-6010 is designed for all positions deep penetration electrode with a spray arc, flat bead and thin brittle slag. Weld deposit has high tensile strength, ductility and is of X-ray quality. 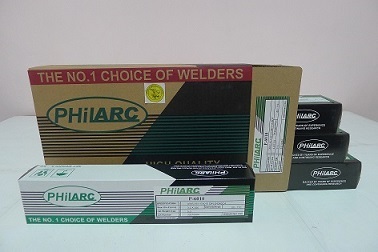 Excellent weldability in vertical and overhead positions. Deposition efficienct is higher than conventional types due to iron powder in the coating. Use DC reverse polarity (DC+) current. Maintain a short to medium arc. Hold electrode perpendicularly to work surface and slightly inclined in direction of travel, keeping size of molten pool small. Clear each bead well before applying the next. Vertical welding can be done starting from the top or the bottom as the work requires. In overhead welding best results are obtained by the multiple beads method. Dry the electrodes at 60-70°C for 30 minutes before use. Copyright © 2013 PHiLARC. Web Design by WebToGo Philippines.